This wonderful Moose project can be displayed year round. The Moose bodies are made from "1x4" pine. Patterns drawn FULL SIZE. 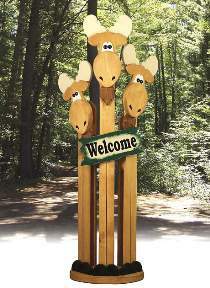 Measures 63"H. Order Brown Eyes and your choice of Welcome or Wipe your Hoofs Decals below.